Good wood for guitar building is becoming harder and harder to find. Building a guitar using the methods I demonstrate in the book and dvd require some wood not normally found in guitar building supply places. I really didn’t realize this until after the book was released and I was flooded with requests for this wood. To help readers make a concert quality guitar I had to provide the material because they could not get it anywhere else. This wood is difficult to find in small quantities and at the sizes required. I realized that most people did not have the equipment to mill this wood themselves at these small dimensions. 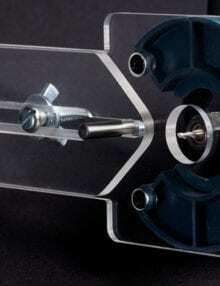 In order to mill wood to .024″ or .045″ requires high quality accurate machinery which is quite expensive. I also realized people were not going to buy hundreds of square feet of veneer just to make one or two guitars. I purchase this wood in large quantities, so I started selling my wood. 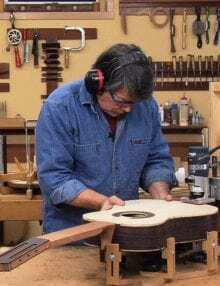 For a better understanding of the wood used in guitar building be sure to check out the Learn About Guitar Wood section. I have partnered with Allied Lutherie to provide a complete kit which includes all the wood necessary to build a guitar using my methods. I have been buying my wood at Allied Lutherie for almost 20 years and they deliver quality wood for guitar building. Customers can conveniently purchase everything they need to make their guitar all at the same place with one click. The complete classical guitar wood kits include wood for the top, backs, sides, neck, braces, fingerboard, bridge as well as the bone inlay and fret wire. 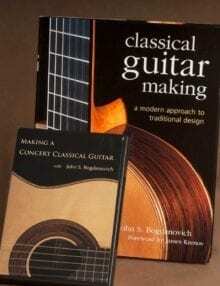 The classical guitar details kit includes all the wood that is particular to my guitar building methods such as side and lining laminations, all the material to make a rosette as shown in either the book or dvd, back braces center patch, and bindings . The wood and colors chosen will work with either spruce or cedar top guitars. Customers can use whatever wood they like for backs sides, top and neck. Laminated sides and linings are really the way to go. There are so many good reasons to laminate these parts of the guitar. You can read more about laminating guitar sides and linings here. The techniques used for laminating are demonstrated in both the book and the dvd. I use two species of wood for side laminations depending on what wood I use for the top. For spruce top guitars I use Alaskan yellow cedar , andfor cedar top guitars I use pear wood. These combinations work well and make sense visually. All my linings are laminated are made from mahogany. Customers can find headpiece veneers and decorative veneer sheets of the same wood type for a consistent color scheme.The ebonized pear wood I use for black in purflings and rosettes is far superior to the dyed black veneer sold at luthier supply companies. It cuts planes nicely and leaves no voids. All the veneer and laminations I offer are the same ones that I use on all my guitars and are of the highest quality. Slotted fingerboards are available in the store. I recommend buying a slotted fingerboard unless you have a slotting system for your table saw. Fret slots should not be cut by hand. They need to be accurate. In guitar building there is enough going on without worrying about fret placement. You should slot your own boards after you have accumulated some experience and only if you have a table saw fret slotting system. I use a compensated fret spacing for better intonation up and down the fingerboard on all my guitars. This is the same fret spacing used in the book and DVD. This spacing differs from the standard rule of 18 fret spacing for a bit better intonation up and down the fingerboard. I also offer the fret slotting template for use with a table saw as well as a fret slotting kit with all the stuff to put a table saw sled together. Finding suitable detail wood for guitar building can be difficult. Typically the wood must meet certain criteria. Wood used for bindings should be hard, easy to bend and work visually with the overall scheme of your guitar. I offer Jatoba for a general binding wood because it meets this criteria and works nicely with either spruce or cedar top guitars. J.S Bogdanovich Guitars also offers wood for cross-grain back center patches and burls for rosettes. The purpose of the patch is to provide stiffness and integrity to the center seem of the back which may have a decretive veneer motif. The cross-grain back center patch can be difficult to find wood for. Customers can make the rosettes in either the book or the dvd with the rosette kits. The kit contains everything you need to create the rosette including enough veneer for a wheat stack. The wheat stack will provide enough herringbone or and wheat motif for more than one guitar. Maple Burl for the rosette center ring can be purchased individually for additional rosettes. Occasionally back braces, neck blanks and tops. Check in every once in a while to see what is available.